Social responsibility gets a clever, recycled remake with our ECO Green Collection. Featuring upcycled wine bottle containers, triple-milled shea butter in our olive oil soap, and smartly designed packaging�including exclusive wood veneer tubes. Our ECO Green Collection comes in eight glorious and guiltless fragrances. 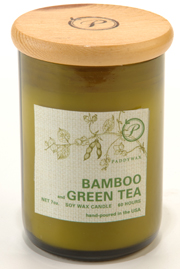 Paddywax's signature Soy Wax, scented with Bamboo & Green Tea, poured in a 7 oz. recycled wine bottle.